The Angel In The Car Lot – I Believe in Angels – Do You? It was a happy occasion for us.. I had sold my house, bought a manufactured home, and finally, in January, 2006, I went to a local car dealership to pick up my new (used) car. 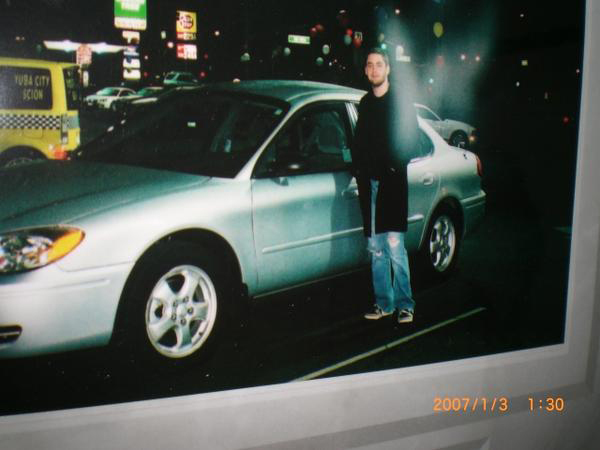 After much deliberation and negotiation of price by my grandson Ryan, age 21, we finally decided upon a 2005 Ford Taurus. Ryan accompanied me to pick up the vehicle; however, we did not know we were not alone! 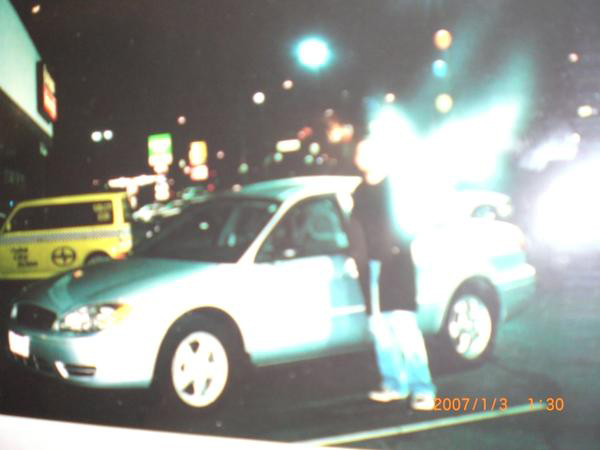 After we sealed the deal and he gave me the keys, the salesman wanted to take a photo of me standing next to the car. (This is part of a courtesy they do for their customers.. He told me the photo would appear on a calendar they would send to me in the mail.) I decided I wanted Ryan to be in the picture instead of me. When I got the photo in the mail attached to the calendar, I was a little disappointed because there was a strange white image next to Ryan in the picture.. When he came over we decided this image just might be an angel!! Our family has a history of angels. When Ryan was a little boy, he used to tell me that “A little boy angel with wings” came into his bedroom at night if he got scared of the dark.. (And who was I to argue!) To this day, he still remembers that angel..
Also, when my daughter Lori was a little girl she saw a “silvery angel with curly hair” one day when she “felt a little sad”.. (She still remembers the angel to this day at age 40!) Ever since my children and grandsons (I have five more) were little, I have always prayed to the Lord that angels would accompany them wherever they would go. I guess they have been..
One year after the photo was taken Ryan came to visit me again.. I only see him a few times a year. He decided to take a picture of the photo with his cellphone and post it on a blog on his computer.. The first picture came out the same as the calendar photo.. (see small image in first picture.) Then, a minute later, he took another photo and it came out with the white image enlarged, illuminated, and looking very angel-like indeed, with lights cascading down from above! We both laughed and were amazed at the outcome! (see second picture.) When Ryan got home from his trip, he wrote on his Myspace blog (after he posted the photos and explained what happened).. “It’s nice to know we’re not alone!”..